2 years ago, our family ventured in a Halloween costume Philippines making business. We have our good friend, Lori Pacampara who assisted and helped us as our partner to conceptualize different kids and adult new designs for our Philippine Halloween celebration suits. Some of them have been offered for cheap rent in Manila where we are based from while some of the new ones, we've managed to enter in to a contest over in Star City where our 2 entries won 3rd prize in consecutively 2 categories out of 3 available for joining the said contest event held yearly inside the theme park. You can see full list of our Halloween costume photos here - http://www.internetphilippines.com/events/we-won-the-star-city-halloween-contest-2011/ which were back in 2011. This year, we might not be able to join again as our partner artist is already so very busy with her new field of work at the Bahay Nakpil tourist spot in Quiapo, Manila. Allow us to feature our unique and out-of-this-world Halloween costume designs for kids here. This set of suit was made under copyright to our artist friend, Lori Pacampara who is an artist by heart and soul. 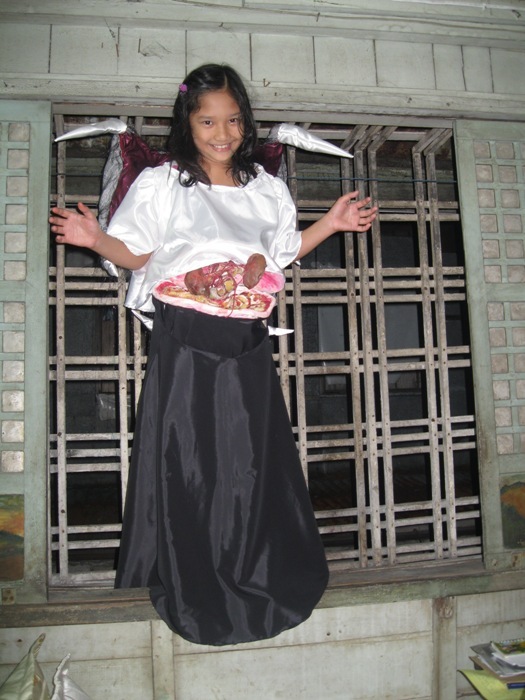 See photos of the local Pinoy tradition suit during All Saints Day and All Souls Day celebration in the Philippines. Above is a custom-made props that you can use and rent for your Halloween event this year, 2015. 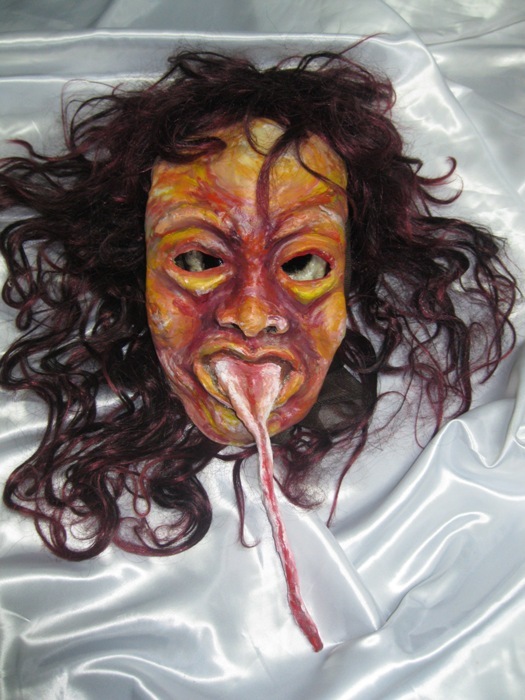 This mask is our specialty effects that used creative rubber prosthetics making skill to make by our artist business partner, Lori Pacampara. Apart from our start-up costume-making business back in 2011, we also intended to join SM Mall contests which apparently did not push through with the hectic schedule of rentals and effects / props by different offices and people looking to hire our services to design their event place for a Halloween party. We've instead shifted our gear that same year towards providing and being a top provider for customized and RTW Halloween costume Philippines for pets, dogs and baby but we could not cope up with the demand by customers and at the same time, our artist partner is no longer giving full time interest and enthusiasm for the project so we instead decided to let go of the big business investment plan to sell and offer renting our merchandise. The orders we took were cancelled the sooner to avoid unsatisfied customers.